Susanna M. EDGAR, married John Monteagle BROWNE. Jane EDGAR, unmarried, died about 1919 at Tullycarnen, Ardglass, Co. Down. Hugh EDGAR, born 1835, unmarried, became minister at Aghaville. Died April 22, 1894. 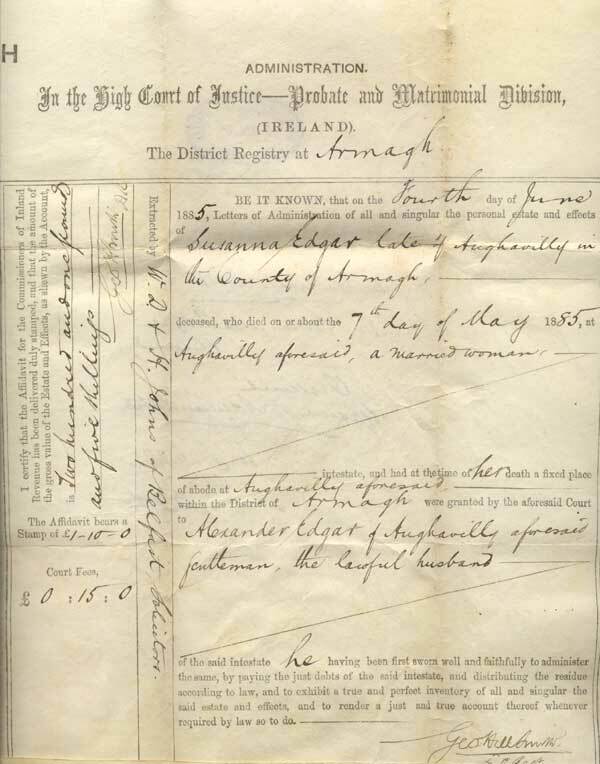 The will of Susanna M. EDGAR is the only document that we have for this couple. From an entry in “Armagh Clergy 1800-2000", p. 113, we know that Alexander was a carpenter in Belfast. From Martin's Belfast Directory 1840_41, page 124 there is also an entry for Alexander EDGAR, joiner who lives at 40 Academy Street. On Page 13, (unless I wrote it down incorrectly) there is a reference to an Alex Brown, carpenter, also at 40 Academy Street. There was also an inscription in a photo album owned by June BROWN (our grandmother) that was penned by an A. Edgar. How Alexander went from being a carpenter in Belfast to a “gentleman” (as noted in the will) in Aghaville is still to be ascertained. The fourth brother [McKEE] settled in Lisbane, near SAINTFIELD, County Down with a fellow soldier named EDGAR, both of whom have many descendants in the neighbourhood still (1890), who have intermarried for several generations. This soldier whose name was probably Hugh, had settled, built his house, married, and possibly had some children born to him before the year 1700. On the Lisban road, going from Lough Henney to SAINTFIELD, about a half mile after crossing Belfast Road, your attention will be attracted towards the right by an ivy covered gable, which is all that remains of the original Edgar house. Margaret MCKEE, daughter of John MCKEE of Lisban married a farmer called EDGAR. One of Margaret’s sons became the celebrated Rev. Samuel EDGAR, D.D; LL.D, of Ballynahinch and professor of Divinity for the Secession Synod. He married his first cousin, Elizabeth MCKEE of Poagsburn. Two of his sons became clergymen; David as his father’s successor in Ballynahinch for fifty years, and John as a minister in Belfast, where he was professor of Systematic Theology for the General Assembly of the Presbyterian Church of Ireland. Most of the MCKEES and nearly all of the EDGARS of County Down bury at Lough Henny graveyard. The graveyard is situated on an eminance overlooking the lake ... There is no church at it or near it, but tradition says that the ruins of some building were once visible ... nobody bearing the name of MCKEE or EDGAR can walk over Lough Henny graveyard without treading on the dust of his relatives or ancestors.